Plywood makes the construction of larger items much easier due to the sheer size of plywood sheets (8’ x 4’; or 125 x 250 cm in Europe). Sheets may be cut to appropriate size readily on a table saw or with a skil saw using a straightedge guide clamped to the wood. However, there are some cuts on plywood that are difficult (if not dangerous) to make due to the intricate nature of the cut. Notches in plywood comprise a special class of cuts that pose unique challenges in executing them properly. 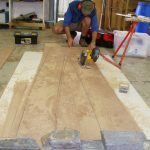 There are several tools and techniques one may use to cut notches in plywood, and all of these methods have benefits and drawbacks. The following will focus on the cutting of a notch in plywood on the bottom of kitchen cabinets to clear a space for your feet. The average size of the plywood sheet is about 3’ x 3’ (90 x 90 cm) and the notch is approximately 4” x 4” (or 10 x 10 cm). The first method of cutting a notch in plywood would be to use a table saw. A sufficient notch may be cut using a table saw, but the circular nature of the sawblade means there would be overcut on the bottom of the cut. If you cut to the line, then the blade will cut more of the plywood below the line. To minimize this overcut, the operator could extend the blade to its maximum height. This, however, exposes the operator to the maximum amount of exposed (spinning) sawblade and also increases the risk to the operator. Another way to avoid the undercut would be to (again) maximize the blade exposure to the depth of the cut and hold the plywood vertically with the ¾”/20 mm side resting on the table surface. This introduces an awkward handing of the material (short of building a complicated jog to help hold the piece safely). Due to these complications and safety concerns, the use of a table saw is not recommended for a simple notch cut in plywood. By far the most effective method in terms of speed and ease would be to use a simple jigsaw. These inexpensive tools are found in almost every DIY toolkit and don’t receive the amount of respect they truly deserve. These tools can easily cut a square notch in plywood as well as circular profiles—the topic for another discussion. The user simply keeps to the cut line and the vertical motion of the saw itself prevents undercutting. Furthermore, a jigsaw can cut in both directions without a blade change from rip to crosscut since layers of plywood alternate the direction of the grain—which incidentally gives plywood its stability. However, this flexibility also comes with a bit of a penalty—jigsaws tend to leave very ragged edges on the bottom side of the cut. To address this shortcoming, a user can substitute a very fine blade which takes longer to make the cut or they can score the underside of the cutline with a vary sharp knife. Scoring plywood in this way prevents a lot of the tearout from a jigsaw cut (though not all). A fine jigsaw blade doesn’t always make a cut without tearout—and even a steady hand doesn’t always produce a perfectly straight and smooth cut. Some notches (likely not on kitchen counter cut-outs) must be smooth, straight and free of undercutting. For that, a router works well… but still needs a hand to finish things up. Routers cut notches with exceptional precision; if the router has a guide or an easily-made jig for the size of the cutout then routing the opening is incredibly easy. The one drawback for using a router to make a notch in plywood is the rounded edges in the corners which should meet at 90°. For exacting work, such a rounded corner often prevents the perfect fitting of mating parts or leaves a blemish that easily draws the eye. There are a couple of ways to minimize this rounded edge or eliminate it altogether. If the home DIY’er seeks only to minimize the rounded edge and makes a good jig to cut the original notch, then using a small diameter router bit minimizes the diameter in the subsequent corner area. The smallest bit size for this type of an operation would be a ¼” bit (US) or 6 mm (metric). 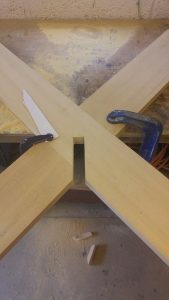 If the corner must be 90°, then after routing the original notch one can use a couple of tools to clean out that rounded corner. The easiest way would be using a very sharp chisel and paring the edges perfectly parallel to the notch cut (so that the corner becomes 90°). Cut halfway through both sides and meet in the middle to avoid tearout. Other ways to clean this cut up…using a fine toothed gent’s saw or hobby saw, which has > 20 teeth per inch (TPI) or 8 teeth per cm to make a very fine cut with little to no tearout to clean up the original cut and bring the original corner to 90°. In short, there are a few ways to make a notch in plywood. The most straightforward method requires only a simple jigsaw and a steady hand. For more intricate/exacting work, a router followed by squaring up the rounded edge in the corner is also pretty simple though a little more time-consuming. Cutting notches in plywood doesn’t need to become a daunting task or one that breaks the bank either.